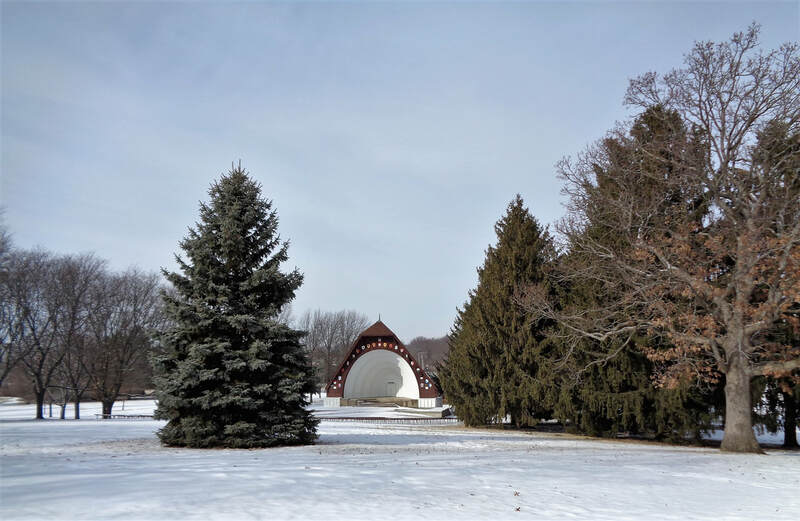 The bandshell is located in Twining Park on a sloping hill with benches built into the hillside for the audience's optimal viewing. According to Paul Klinzing, Monroe Parks Director/City Forester, the Twining Park bandshell was originally built in 1961. It was destroyed in the 1965 Palm Sunday tornado. There was discussion when it came to rebuilding the bandshell that it should be built on a smaller scale and of a different design so it wouldn’t be damaged again. Band Director Allan Barnard was instrumental in seeing that the bandshell was rebuilt to its original style in 1966. The front of the bandshell displays the Swiss Canton coat of arms or states of Switzerland which reflects the Swiss heritage of the community. Its interior is constructed with several semicircular concentric arches that taper to the back and are each lit to highlight the design. The cost or who the architect is unknown. The bandshell was repainted and stained in 2017 summer and new Cantons were painted onto the frame. The shell is used by the City Band for concerts on Monday evenings in the summer. There are also several weddings that take place their every year as well church services. As sunset approaches behind the bandshell, it combines with the music to add to an evening of delight.